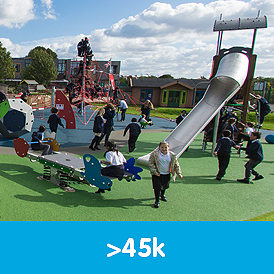 A primary school playground is more than just a breakout area. Quality playground equipment engages children and makes school more enjoyable, boosting attention spans and general student satisfaction in the process. We believe that every school needs an exceptional playground, which is why we offer a variety of popular primary playground equipment in numerous different styles. Our playground equipment offers the perfect combination of sensory, physical and social stimuli, making it versatile and useful in education as well as play. 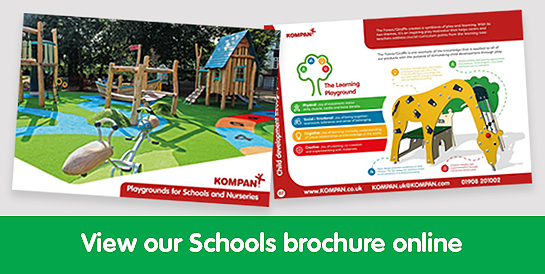 Similarly, include Kompan’s exceptional primary school playground equipment in your lesson plans and watch student engagement soar. At Key Stage One, students are engaged by inventive, fantastical settings, filled with magical stories. With this in mind, we have developed our primary playground equipment to stimulate students’ imaginations whilst developing role-playing and sensory skills in the process. The combination of these techniques has made our equipment useful for building friendships and encouraging student-managed storytelling - an essential aspect of cognitive, social and language development. In addition to the cognitive benefits, high-quality primary school playground equipment inspires students to experience new things first-hand, interacting with moving parts and improving cross-body coordination whilst maintaining a fun and engaging atmosphere. At Key Stage Two, students find thrills in speed and balance challenges which is why our equipment focuses on agility and coordination tests to push their abilities. 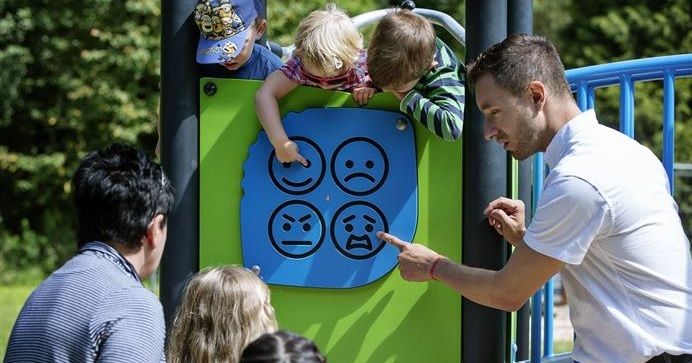 By encouraging group play and competition, our playground equipment can educate pupils on empathy, cooperation and conversation through enjoyable play. Challenge your students through physical starter activities and watch them become interested and engaged the moment you’re back in the classroom. By drawing upon educational research and thorough testing, we have created a varied range of top-quality primary school playground equipment. Every one of our products is created with child development and versatility in mind, making them enjoyable to use and beneficial in the primary school environment. Our innovative and creative themed play range is the perfect addition to any playground. 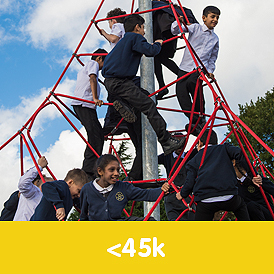 Specifically designed to encourage creative thinking, this primary playground equipment gives young minds the room to imagine and develop their physical, cognitive and social skills. Featuring all sorts of different designs and styles, you’re bound to find suitable equipment for your playground. 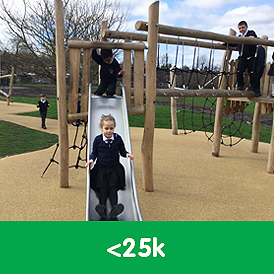 Giving your playground that iconic natural finish, the Organic Robinia Wood range is a safe and versatile playground solution, perfect for encouraging wildlife exploration and comfort in the outdoors. With traditional play options as well as a variety of different playhouses and socialising opportunities, this primary school playground equipment is universally loved. Our adaptable multi-play structures are excellent enhancers of young imaginations. Grabbing children’s attention with the promise of speed, excitement and movement, this playground equipment is prepared for all forms of child engagement with both moving parts and social areas. Sometimes the classics are all you need. Our traditional play range is suitable for all playgrounds in all settings. With sand, water and movement play options available, there are countless opportunities to excite children and develop their cognitive, social and motor skills. 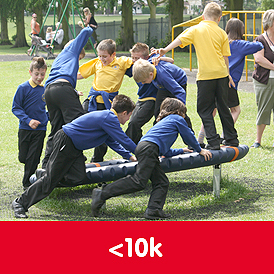 If you’re looking for exceptional quality and proven effectiveness, then you can’t go wrong with our traditional primary school playground equipment. Utilising our high-quality wooden and aluminium park playground equipment, you can open the doors for social development in your primary school. We also offer a customisation service where you can create the perfect park equipment for your school with the help of our design team. Made from steel and plastic, our urban climbing playground equipment is the perfect combination of durable and enticing. Testing both complex route planning skills and physical dexterity, our equipment pushes children’s abilities through active play. Varying from our sturdy BLOQX™ boulders to the exciting GALAXY™ and ICON™ ranges, there are options to suit any primary school environment. The Learning Playground meets the needs of current and future goals for teaching and learning activities. With the approach of The Learning Playground, lessons will be more varied motivating as high standard curricular content is combined with more physical activity and play during lessons. The materials of The Learning Playground build a bridge between indoor and outdoor learning and deliver curriculum lesson plans which fulfil specific learning standards and promote good practice in the delivery of the National Curriculum. Motivating children to learn and cooperate in an active way. Check out the video of the playground opening at Broad Heath Primary to see our equipment in action! To find out more about our products and services, call us on 01908 201 002 or click here to get your free quote.